This is really OUR history WITH Okapi. Read this like an old photo album. Fading slides were digitized with a rather too-cheap home digitizer. The time period 1986 -1990. John and I were hired by New York Zoological Society to do a radio collar study of Okapi. 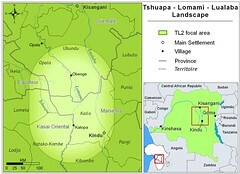 We based in the village of Epulu in the Ituri Forest, but we sought our research site beyond the forest hunting zone. We camped at the confluence of two forest streams, the Afarama and the Edoro. Dividing up the loads to walk out to Afarama camp. Two of these four fellows are Mbuti pygmies. 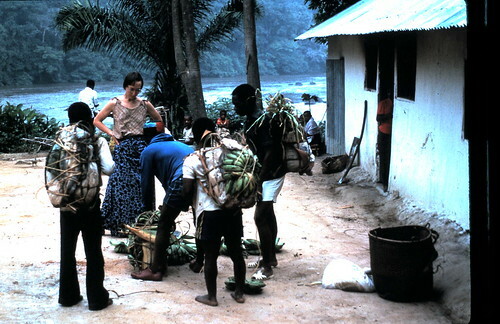 More than half of the team were pygmies; they knew the forest best. It was more than a 23 km walk from the village to Afarama. We eventually cut a trail straight south to the rode. That was 18.5 km. 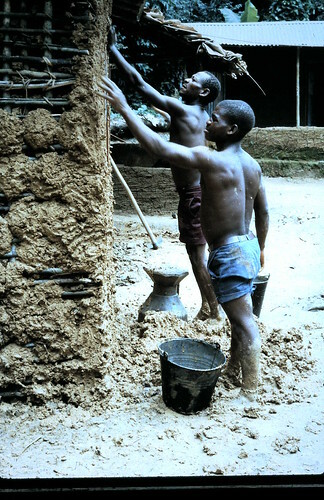 One wall at a time we replaced the leaves with mud — a sign of permanence and, in fact, Afarama camp still exists although the okapi study is long since over. 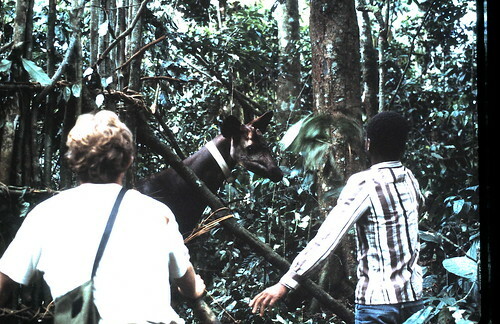 The study began in earnest when we caught our first okapi, a young female, Paskalina, caught Easter day of 1986. We kept expanding the study area to include the home ranges of all our collared okapi. In a couple years more than 50 sq km were covered in a grid of paths. 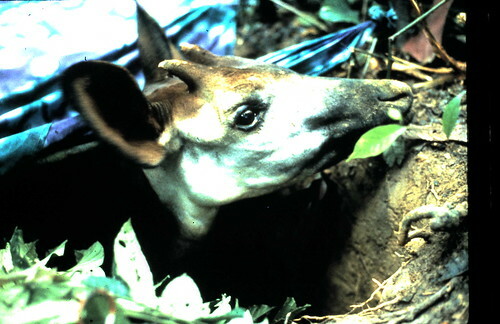 This is a male okapi in a capture pit. 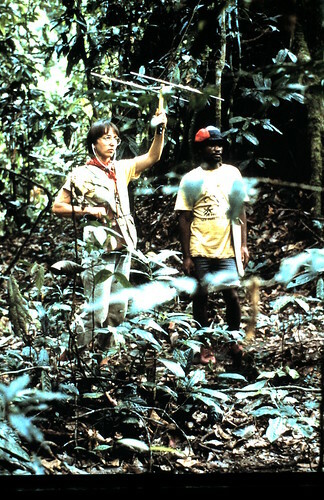 We followed the okapis with radio receivers and hand-held antennas. I am with Kenge’s son Atoka here. Every morning about four of us would take off in different directions to find specific okapi. 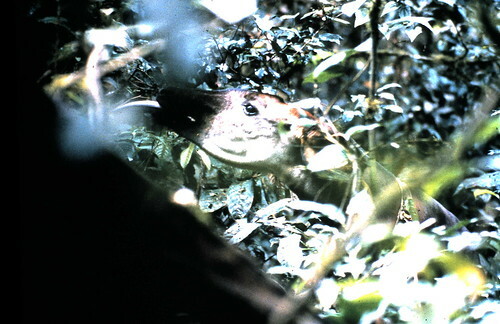 This female is extending her “giraffe” tongue to strip leaves. 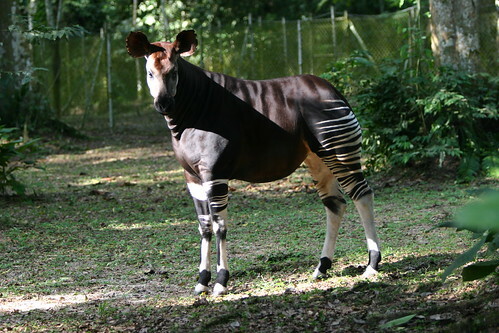 The okapi are strict folivores. Females have exclusive ranges of 5-7 km2 and males have larger ranges (15-20 km2) that touch several female territories. Females are bigger than males, males approach them with “respect”. We took lots of pictures of okapis in the wild, although they all had radio collars on. John and I recording okapi browse in the understory. We are with Kenge, who knew his plants well. We identified well over 100 plants whose leaves are eaten by okapi. If you want a much better view than these few snaps above, look at the flick. 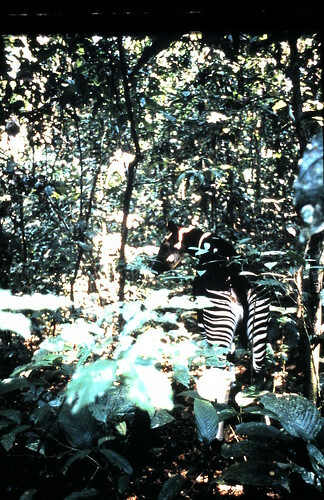 An okapi in captivity in the ICCN enclosures in Epulu. Stunningly beautiful. This entry was written by Terese Hart, posted on 2008-10-22 at 12:00 pm, filed under Okapi. Bookmark the permalink. Follow any comments here with the RSS feed for this post. Post a comment or leave a trackback: Trackback URL. 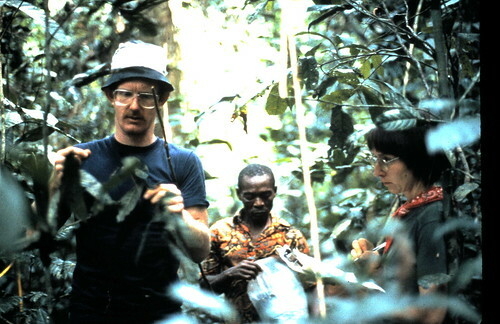 One thing that stood out for me in the Alan Root’s film was how docile the Okapi were in the pitfall traps. Remarkably gentle. That sequence of the one Okapi emerging from the trap, stopping and looking right back into Alan’s (Bruce’s?) camera is priceless. Great animals. And the chimps eating the Okapi carcass. Wow. Site still wonderful and updated every time I drop in…..the okapi study retrospective in amazing. Wow the Okapi is an amazing animal. The males having ‘respect’ toward the females is just gorgeous. Greetings, John! I’m trying to get ahold of you — saw Chere Lott yesterday for the first time since Danane, and we started trying to contact all 14 to see about a reunion next year (50 years since the Big Adventure!). Please contact me! Would love to see you! Your work is just amazing!